Napakiak’s village center sits just a few hundred feet from the rapidly eroding Kuskokwim riverbank on September 27, 2018. Napakiak is eroding away three times faster than it was just 10 years ago. 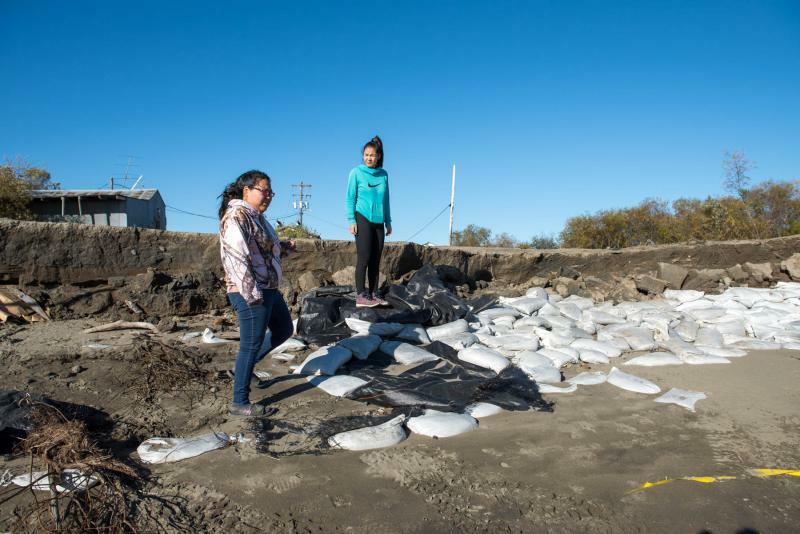 High School students examine a pile of sandbags meant to protect the village of Napakiak, Alaska from eroding into the Kuskokwim River on September 27, 2018. With 112 feet lost in just the past seven months, sandbags aren’t doing the job. A four-wheeler flies down the road in Napakiak, Alaska on September 27, 2018. 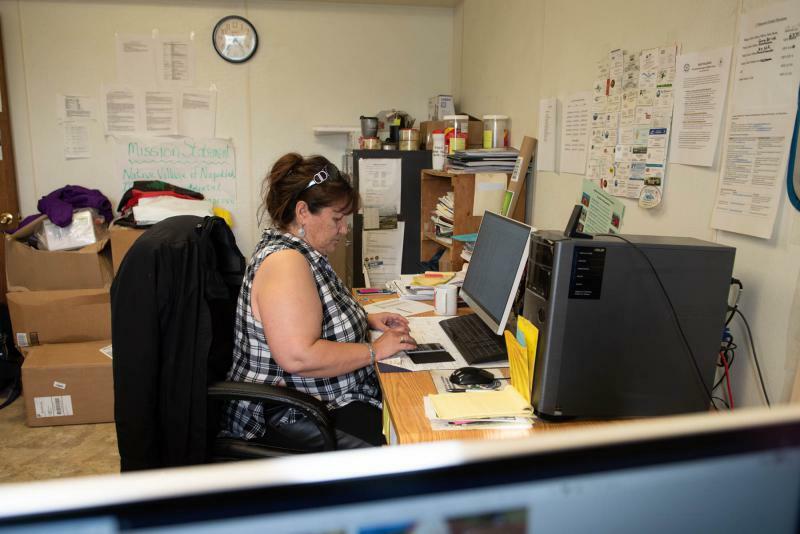 Napakiak Mayor Joann Slats works in the city office on September 27, 2018 in Napakiak, Alaska. 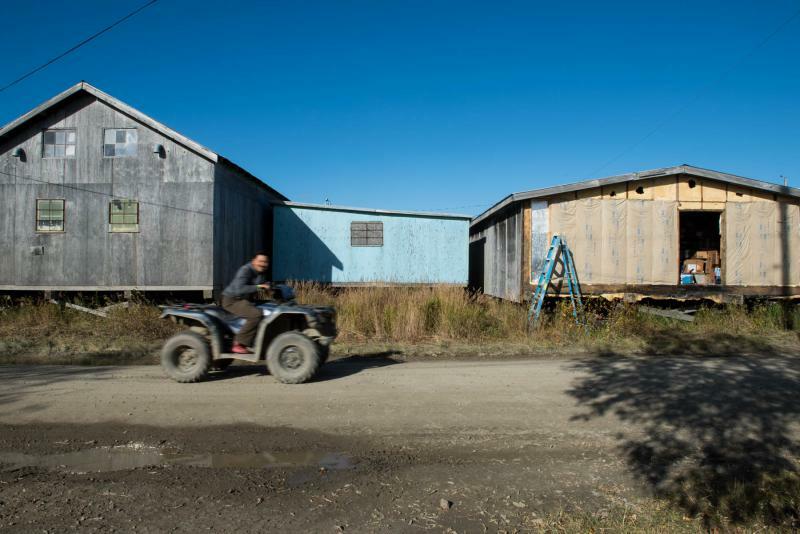 Slats is one of the village leaders charged with finding funds to relocate the community further from the eroding Kuskokwim riverbank. 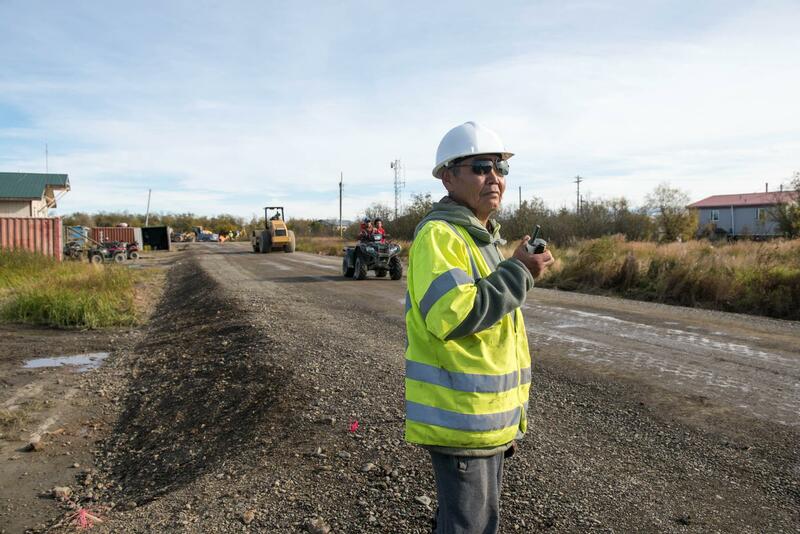 City Council Member Walter Nelson works with a road crew to reinforce Napakiak's gravel road system on September 27, 2018. 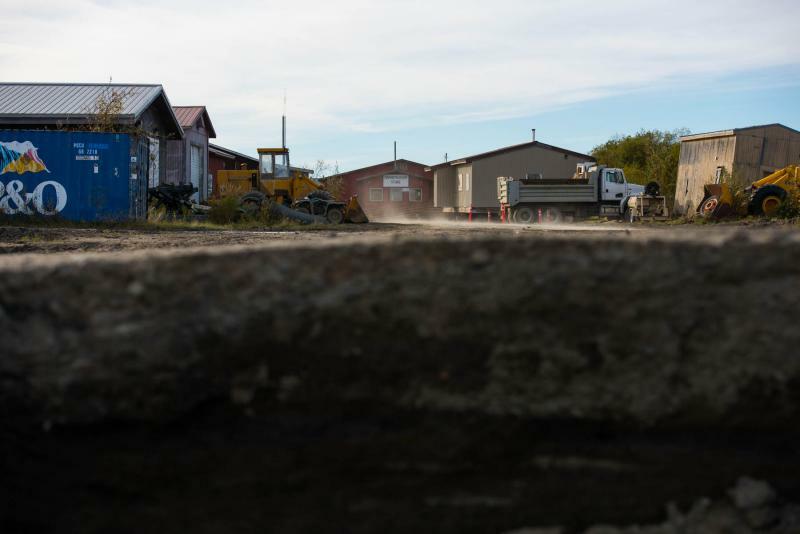 The project will stabilize the roads and allow for safe transport of buildings away from the eroding riverbank in Napakiak, Alaska. 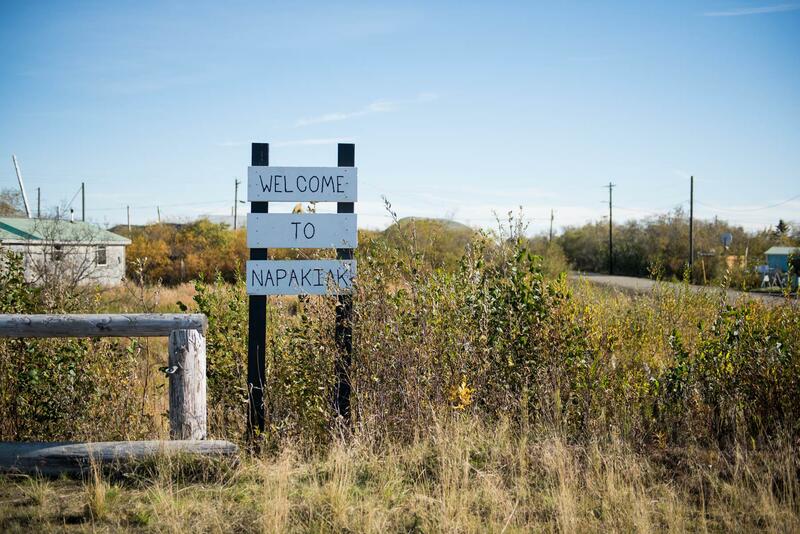 A sign near the Napakiak Airport welcomes visitors on September 27, 2018 in Napakiak, Alaska. For decades, Napakiak has been picking up and moving its buildings further from the encroaching Kuskokwim River. The City of Napakiak, the Napakiak Tribe, and the Napakiak Village Corporation have worked together to fund and coordinate the effort. Now, the erosion is accelerating and threatening critical infrastructure that’s too big for the community to move on its own. The community is seeking outside funding to help. At the beginning of December, Napakiak Mayor Joann Slats, along with another community member, stood in the snow on the Napakiak riverbank and began pulling a measuring tape from the bank to the school. She paused as she tramped through willows to reach the school. “Stretch!” Slats called to her friend as they pulled the tape taut through the brush. Slats measured from the same point on the school to the riverbank in May, and then again in late July; the difference is significant. In all, between May and early December, more than 112 feet of riverbank has washed away. This loss is more than three times the annual rate of erosion that was occurring a decade ago. For now, the Kuskokwim River has frozen in place. The ice should stall Napakiak’s erosion for a few months until spring breakup. While the erosion takes a hiatus, the community is taking action. “We’re making plans to move a couple homes, hopefully this winter, and two other buildings here that belong to the city." Slats explained. "Hopefully the erosion doesn’t beat us." The community should be able to move the two homes on its own like it’s done with many homes before. As for the two city buildings, the community is waiting to learn if it will receive federal funding to move the Napakiak Fire Department and city's garage. 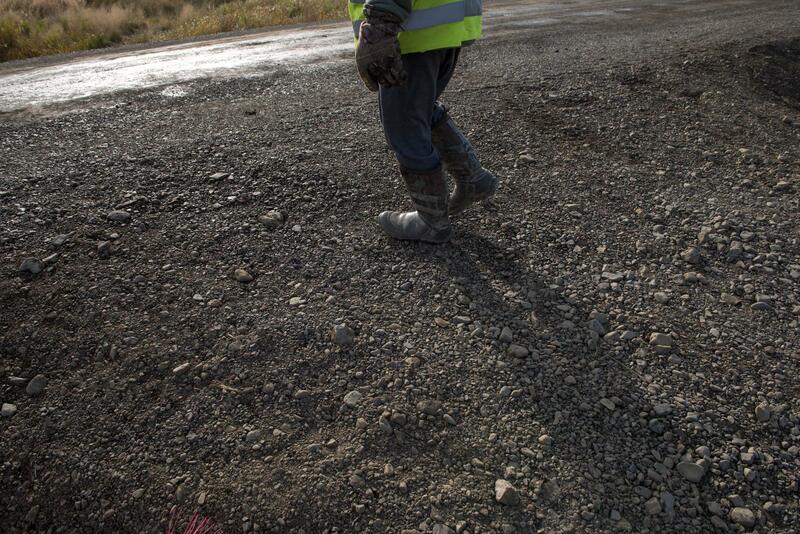 This summer a crew reinforced Napakiak’s gravel road system. The project, combined with winter’s freeze, should provide a stable surface for transporting the buildings before spring. Funding for other erosion-related projects has already been secured. Napakiak has received $449,000 in federal funds to replace its boat and hovercraft landing. Both washed away during a Memorial Day storm this year when 30 feet of riverbank disappeared overnight. Napakiak has also received $131,586 in federal funds to develop an environmental risk assessment for the community. Community leaders are working closely with the Alaska Native Tribal Health Consortium to apply for more government and philanthropic money. The community is also deciding whether to pursue total or partial relocation. While most of Napakiak is under the control of the city, tribe, and Native village corporation, the school belongs to the state. What, if any, funds will be available to help relocate or rebuild a new school further from the eroding riverbank will be decided when legislators gather in January. This story is part four in a four-part series on erosion in Napakiak.